The October 2018 Substance News homepage is devoted to stories and comments about editor George N. Schmidt, who died on Sept. 17, 2018. Stories about George’s personal life appear on the left column of the homepage; articles about his work life are posted on the right. Thanks to the many Substance reporters and contributors for bylining these articles. 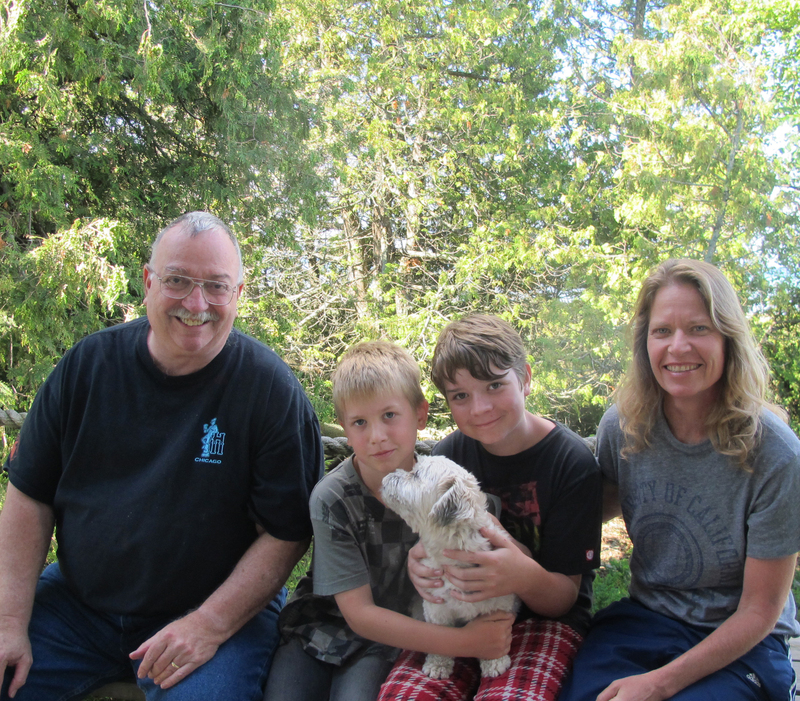 George Schmidt poses with sons Josh and Sam, Bear the dog, and wife Sharon Griffin Schmidt in the summer of 2013. His eldest son Dan lives in California.To contact me, currently serving as Substance editor, email sharongriffinschmidt@gmail.com. I was lucky enough to know George for twenty-five years. I worked with him at the Union and he helped give me insight for my Union activities at my school but also for my work on the pension fund. I remember meeting him in the House of Delegates at the Old Bismarck Hotel downtown when I first became a member of that body. I think it was 1993. He met me at the door and could see from my face that I had no idea what to do. He quickly introduced himself and "explained" the workings of the union to me. I had entered the HOD energized that day, but left twice as motivated after talking to George. I said to myself, "I thought I was passionate about this stuff, but this guy (George) is waaaaay more into it than I am." It felt good not to feel alone in my desire to make the world a little more equitable for workers. George Schmidt's commitment to social justice was inspirational and still motivates now that he has passed on to the great Union Hall in the sky. Every time I enter the Union Hall or the Chicago Teachers Pension Fund, I think, "George Schmidt, Presente!" Now that George isn't around, it's great to see photos of him and you guys, Sharon. Miss him and look forward to visits with you. I wish the union hall had photos of the union's remarkable activists. A mural would be wonderful. Just an idea...anyone? How about a song for George the union fighter--Jay and family, anyone? I haven’t forgotten George or your family and I want you to know that. I’m on the Orange Line leaving the loop and I hear George’s voice telling about the first Substance that was downtown on Wabash. He was working with Lou Pyster then. I will always adore Substance meetings at your house. I am thankful to have learned so much of the history from George, Grady Jordan, Terry Daniels. It was also an honor to photograph with Substance. Thank for all you have done and continue to do. Like your article on the new school in Dunning. We live near there, giving us a front row seat to this latest iteration of race and classism in our fair city. George Schmidt is not forgotten. Yep, George won't be forgotten as long as we keep using the word "iteration" which I think many of us learned from him as it was one of his favorites.